Smartphones and other mobile devices have permeated our lives. No matter where you go or what you do, odds are good that you carry one with you and use it several times a day. While there’s a myriad of different uses for a mobile device, one of the most common and intrusive is social networking. Whether it’s Facebook, Instagram, Snapchat, or one of the countless other platforms roaming the digital landscape, social networking has invaded our lives and gotten a lot of people hooked. Many people would love to throttle back on their social network usage but need a little help in doing so. That’s where the Android app “Antisocial” comes in. 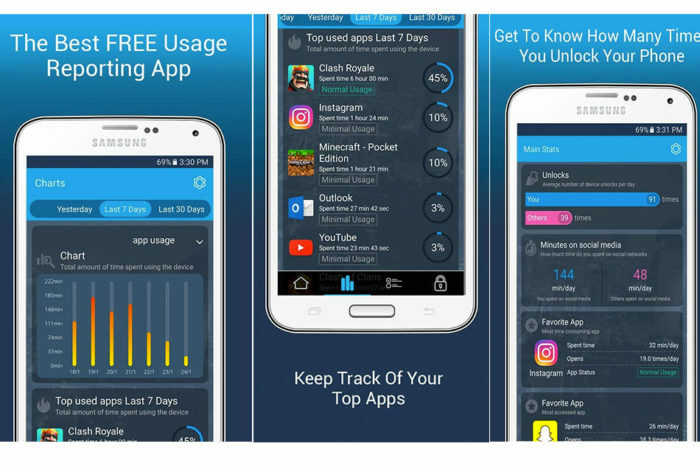 This free app promises to analyze your social media usage (as well as some general mobile device usage) and provide in depth statistics to help you on your way to kicking your social media habit. I recently spent some time with Antisocial to see if it lives up to this promise. Upon first installing the app and being walked through the set up process I was greeted with Antisocial’s main interface. For the most part it’s clean and intuitive, showing an overview of core information in a straightforward manner and offering a row of tabs at the bottom of the screen for deeper analysis. Some of the text on the interface is poorly written (the phrase “We start monitor your activity” being a prime example) but most users will still be able to navigate with ease. Some of the stats on the overview page include your “Score” (a general mark of how well you are shying away from your device), a chart of how much time you’re spending on your phone vs. how much time other Antisocial users are spending, and even the number of times you’ve unlocked your device. Overall this gives you a good, clean picture of just how tight a hold your smartphone has on you. The app’s other tabs provide more information and functionality. In the “charts” tab you’re able to get a more in depth look at how much you’re using your device and even which apps you’re using the most time on. You’re even able to adjust the time scale so that you can see your chart for the day, the last week, or even the last month. Moving over to the “Blacklist” tab you’re able to block certain apps from running, and moving over to the “blocking mode” tab allows you to lock your device even more. One interesting peculiarity you’ll notice with the app is that many of these features won’t actually work until “Challenge Mode” is complete. In Challenge Mode, the app sits in the background and quietly collects data on your phone usage. The app stays in Challenge Mode for two weeks before unlocking the additional functionality of the device (basically, everything except for the overview and charts tabs). Ostensibly this is so that the app has a good handle on your usage habits before making recommendations on how to cut back, but personally I found it a little odd that it wouldn’t start letting you use the app for its intended purpose immediately. Despite this weird quirk doesn’t hinder things too badly as long as you’re willing to wait the two weeks. At the end of the day the app does what it sets out to do: give social media addicts a clear picture on their habits and offer practical aids to cutting things back. If you find yourself constantly pulling your phone out of your pocket and checking your screen, Antisocial may be worth a serious look.